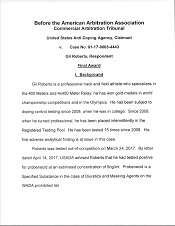 USADA announced today that an arbitrator from the American Arbitration Association (AAA) has rendered a decision in the case of track and field athlete, Gil Roberts, of Los Angeles, Calif., and has determined that Roberts ingested a prohibited substance without fault or negligence and is therefore immediately eligible to compete. Roberts, 28, tested positive for probenecid as the result of an out-of-competition urine sample he provided on March 24, 2017. Probenecid is a Specified Substance in the class of Diuretics and Masking Agents and prohibited at all times under the USADA Protocol for Olympic and Paralympic Movement Testing, the United States Olympic Committee National Anti-Doping Policies, and the International Association of Athletics Federations Anti-Doping Policy, all of which have adopted the World Anti-Doping Code and the World Anti-Doping Agency Prohibited List. Following an expedited hearing in order to resolve Roberts’ case before the upcoming U.S. National Track & Field Championships, the independent arbitrator concluded that it was more likely than not that the presence of a very low concentration of probenecid in the athlete’s sample resulted from unintentional ingestion and occurred without the fault or negligence of Roberts. 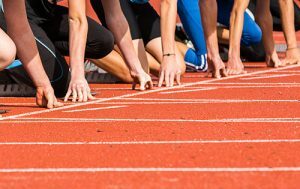 As a result, Roberts will not face a period of ineligibility for his positive test, and because the sample was collected out-of-competition, no competitive results will be disqualified. The decision, as well as other arbitral decisions, can be found here.